It is a widely held view that drug response genes have not proved as useful in clinical practice as anticipated at the start of the genomic era. An exception is in the treatment for chronic hepatitis C virus (HCV) genotype 1 infection with pegylated interferon α and ribavirin. In 2009, four independent genome-wide analyses identified IL28B polymorphisms that predict drug response in chronic hepatitis C (CHC). This discovery had immediate clinical impact. First, the IL28B genotype could be used to personalize therapy. In the 2 years since discovery, most of the more than 100,000 CHC patients commencing therapy for CHC in the West will have considered IL28B genotype testing. Second, the discovery has supported clinical trials for the use of the protein encoded by the gene known as interferon lambda. Third, it is expected that new insights into HCV pathogenesis will follow from studies of how IL28B affects HCV viral clearance and, ultimately, this will lead to new therapeutic strategies for CHC. This review discusses how IL28B genotyping is now used in personalizing therapy and, with the dramatically changing clinical landscape in CHC, with the advent of direct-acting antivirals, the prospects ahead. The recent rapid increase in knowledge of genetic variability and the decrease in the cost of genotyping were expected to lead to an explosion in the number of new diagnostic tests to predict drug response . This has not happened, largely because drug response phenotypes, like many other phenotypes, are probably the net effects of numerous common genetic variants of small effect, and uncommon interacting variants of unknown effect size. A striking exception is the prediction of response to pegylated interferon α and ribavirin (PegIFN/R) for the treatment for chronic hepatitis C (CHC). Four independent genome-wide analysis studies published at the end of 2009 and in early 2010 identified variants of the same single gene as predicting drug response [2–5]. This gene, IL28B, encodes a recently discovered interferon: interferon λ3. The discovery was particularly exciting because the closely related interferon λ1 had just been shown to have promise as an alternative to interferon α in phase 1 clinical trials for CHC . CHC affects more than 180 million people or about 3% of the world's population . The majority of these are in Asia, the Middle East, Brazil and Indonesia; but there are also more than 10 million in the USA, Europe and Australia (Figure 1). Of those exposed to the virus, about a quarter spontaneously clear infection , while the majority develop chronic disease [9, 10]. Disease progression in CHC is typically insidious, but a proportion will develop end-stage liver disease resulting in morbidity and mortality from liver failure and hepatocellular cancer. Global prevalence and genotypes of hepatitis C. Prevalence data are derived from Shepard et al. (2005)  and Te et al. (2010) . Genotype data are from Shepard et al. (2005)  and Te et al. (2010) . The pie chart diameter is Ln (number infected with hepatitis C virus) in the most populous areas of the world. The location of pie charts is approximate, based on the limited studies (reviewed in [27, 28]). Colors in the pie charts represent HCV genotypes: 1, blue; 2, red; 3, green; 4, purple; 5, light blue; 6, orange. Approximately 30 million sub-Saharan Africans have chronic hepatitis C, with widely variant genotypes around the continent. The genome-wide analysis studies were performed in different geographic locales (Australia, Japan, Europe, USA) and in different ethnic populations (European, Japanese, African Americans, Hispanics), but all identified only the SNPs around IL28B as associated with drug response, providing independent replication, and confirming that the data are robust and valid. In slightly over 2 years since these reports, several hundred studies have been published on IL28B and hepatitis C, underlying the impact of this discovery on investigations of hepatitis C virus (HCV) pathobiology. The importance of IL28B for hepatitis C infection and the practice of hepatology is fourfold. First and foremost, it marks host genetic variation as an important player in the outcome of infection, bringing to the fore the era of personalized medicine. From a clinical perspective, genotyping for polymorphisms near the IL28B gene have impacted on decision making with regard to who to treat and when to treat with PegIFN/R, but also for the new direct-acting antiviral (DAA)-based therapies and interferon-free regimens [11, 12]. From the perspective of pathogenesis, the discovery has led to important new knowledge, with type III interferons recognized as the predominant interferon produced by HCV infection in humans and chimpanzees and that best correlates with induction of interferon-sensitive genes (ISGs) . Finally, from a therapeutic perspective, the type III interferons might have a specific role in therapy, with the downstream signaling pathways and their modulation an attractive target for drug development. Given that humans and HCV, and their ancestors, have co-evolved over millennia in different ethnogeographic contexts and have been subject to divergent selection pressures, it is to be expected that both organisms will develop genetic variations that improve survival. For humans, the fact that some individuals but not others spontaneously clear virus suggests that innate and adaptive immune response variations determine the outcome of infection. Viral genomic variation allows for evasion of the host immune response and in this context, suboptimal host responses predispose to the development of chronic infection. Interferons play a major role in the response to viral infections, including to HCV specifically, in both humans and chimpanzees [14–17]. Type I interferons, IFNα and IFNβ, are produced in response to signaling through viral recognition receptors, and utilize the same receptor. The type II interferon (IFNγ) is pro-inflammatory, regulating the direct T-cell and other responses. The three type III interferons (IFNλ 1 to 3) are transcribed from a gene cluster on chromosome 19, are highly homologous, and upregulate the same set of genes as type I interferons, but through a different receptor . It follows that host genetic variation, particularly in innate response pathways, will likely contribute to predicting outcome to treatment with interferon-based regimes. Likewise, viral genomic variation may explain treatment failure in some individuals. This review will focus on the pharmacogenetic applications of IL28B genotyping, the only genetic variant currently used diagnostically to predict drug response. The effectiveness of this genotyping for prediction of therapeutic response and clinical management for dual therapy (PegIFN/R) and triple therapy (PEGIFN/R and DAA) for the different viral subtypes will be discussed. Also discussed are the other genes that have been implicated in prediction for HCV treatment, and other diseases and therapies that might be affected by the IL28B genotype. HCV is mostly spread by blood-blood transmission: typically through transfusion before screening for HCV was mandatory, shared needles in the context of injecting drug use, and use of non-sterile medical devices. If the virus is not cleared spontaneously, it establishes chronic infection of the liver, leading to fibrosis and loss of liver function, some 15 or more years after onset. At this point, the patient with symptoms will present to a clinician. To avoid the risk of liver failure or hepatocellular carcinoma, the patient needs to clear virus. The standard of care treatment in most of the world is PegIFN/R, which is very expensive (about US$20,000 per year). Treatment of the most common viral genotype requires 48 weeks of injection with weekly pegylated interferon α, and daily ribavirin tablets. Most patients report flu-like symptoms and neuropsychiatric adverse reactions, but improved therapies are now becoming available. As disease progression is relatively slow, patients are very keen to know if they are likely to benefit from currently available therapy, or if they should wait for the new, probably more expensive, therapies. For PegIFN/R, IL28B genotyping can predict the chance of achieving a sustained viral response (SVR) or, as explained below, the likelihood of failing to achieve an SVR. The rs12979860 SNP CC genotype predicts response, and the CT and TT genotypes predict non-response . The rs8099917 SNP TT genotype predicts response, and the GT and GG genotypes predict non-response [3, 4]. In east and north Asians, the rs12979860 and rs8099917 SNPs can be used interchangeably in prediction because of the high degree of linkage disequilibrium, meaning that an rs129798690 C is virtually always inherited with an rs8099917 T. In patients of European descent, differing results are obtained with regard to the positive predictive value (PPV) for the SNPs. Based on 941 previously untreated patients of European descent with genotype 1 CHC and known treatment response examined for rs12979860 and rs8099917, the rs12979860 CC had a higher PPV for treatment success (64% versus 55% for rs8099917). In contrast, when the PPV for treatment failure was considered, then rs8099917 GG had a higher PPV (73% versus 69% for rs12979860) . These data indicate differential effects of the SNPs, most likely at the haplotype level (discussed below). In Europeans, an rs12979860 T can be on an allele with rs8099917 G (haplotype 2; Table 1), with the highest prediction of non-response. Or, it can be on an allele with rs8099917 T (haplotypes 3, 5 and 6), which does not increase the risk of treatment failure. Consequently, of the 50% of rs12979860 CTs, those whose T occurs with rs8099917 G have a poor chance of response (30%), while those with rs8099917 T have a better than average chance of response (Figure 2) [19, 20]. aHighest sustained viral response. bCausal haplotype; lowest sustained viral response. cSNPs currently used for genotyping to decide CHC treatment. Odds ratio (OR) and percentage of haplotypes in chronic hepatitis C (CHC) in patients of European descent (CEU) are from Smith et al. . CI, confidence interval. IL28B rs12979860 and rs8099917 genotypes and frequency in Europeans. Blue bars show the percentage of patients with sustained viral response (SVR). 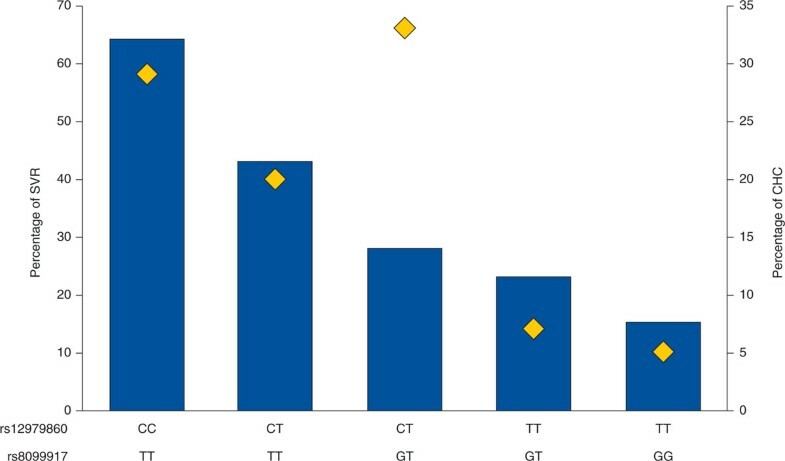 Yellow diamonds show the percentages of the chronic hepatitis C population with the genotype combinations shown. The responses in Figure 2 are from cross-sectional cohorts, reflective of the clinical situation. It is important to note that PPVs for success are higher in clinical trial cohorts, where adherence to regimes is monitored. In the study by Ge et al. , 82% of people of European descent cleared virus if rs12979860 CC genotype, 42% if heterozygotes, and 33% if TT genotype. In people of African descent, rs8099917 is not in linkage disequilibrium with rs12979860 and does not predict response. The SNP rs12979860 does predict response, so that 53% of those with CC clear the virus, 19% of heterozygotes clear the virus, and 17% of those with TT clear the virus. For the same genotype, clearance in African Americans is much lower, and the basis for this has yet to be explained. One possibility is genetic variation in another gene, with human leukocyte antigen C (HLA-C) genotype being one candidate . From the genome-wide analysis studies there were several polymorphisms mapping to the IL28B haplotype block associated with treatment-induced genotype 1 HCV clearance. rs12979860 is located 3 kb upstream of the IL28B gene, while rs8099917 is located 8.9 kb from the start of transcription of IL28B and 16 kb from the start of transcription of IL28A [2–4]. Haplotypes are groups of SNPs that are inherited together, so that the presence of one variant tags the presence of others; for example, a 'C' at rs12979860 indicates that the SNP at rs12980275 is an 'A' (Table 1). These two SNPs are currently used for IL28B genotyping tests. They were identified on genotyping chips loaded with haplotype-tagging SNPs, and as such any SNPs, including many not on the chips, that are also only on the haplotypes they tag could be as good for predicting response. The haplotype with the highest association with response failure is haplotype 2, tagged by rs8099917 'G'. The other haplotypes do not appear to have equal effects on response. The 'T' that predicts response failure for rs12979860 is on haplotype 2, but also on haplotypes 3 and 6, which affect drug response less. The rs12979860 C allelic frequency varies significantly across populations, about 70% in northern Europeans, more than 90% in north and east Asians, and about 30% in African populations where it is the minor allele (Table 2). This difference in allelic frequency for the most part underlies the ethnic-specific differences in response rates to PegIFN/R, accounting for the better response of Asians, and about half the difference in SVR rates between African Americans and Americans of European ancestry . aMinor allele predicts treatment success. bMinor allele predicts treatment failure. cSNPs currently used in genotyping to decide treatment for CHC. %, Percentage of SNPs in major ethnic groups. CEU, European; CHI, Han Chinese; YRI, Yorubi Africans. SNP frequencies are from the 1000 Genome Project pilot genotyping data. Better SNPS for prediction from the haplotypes? There may be better SNPs in the IL28B region, tagging a less common haplotype. An unbiased approach to discover new and better SNPs near the IL28B gene for response prediction, not limited by the genome-wide analysis study SNP design, is through next-generation sequencing technologies. Smith et al. approached this using massively parallel sequencing of pooled DNA from 100 responders and 99 non-responders, and validated this in a cohort of 905 patients. Long-range PCR was used to amplify a continuous 100 kbp region of DNA containing the IL28A, IL28B and IL29 genes. Only SNPs in the IL28B linkage disequilibrium block predicted drug response. Two SNPs, rs4803221 (homozygote minor allele PPV of 77%) and rs7248668 (PPV 78%), predicted failure to respond better than the rs8099917 (PPV 73%) and rs12979860 (PPV 68%) SNPs. The best SNPs tagged a single common haplotype, haplotype 2, and genotypes predicted lack of response better than alleles. Final decisions on the best SNP(s) may follow from identification of the functional haplotype or SNP, although haplotype tagging SNPs will likely be as effective for prediction as any causal SNP they are in complete linkage disequilibrium with. At this stage, haplotype 2 appears to be the causal haplotype. The African American non-response haplotype, currently best tagged by rs12979860 T, with less significant P values as SNPs upstream and downstream are sampled, likely contains the functional SNP(s) [2, 22]. The SNP found to best predict response in the study by Smith et al. was rs4803221, which is in the CpG region of the proximal promoter with rs12979860. It will be interesting to establish if the subsection of Africans with rs12979860 T and rs4803221 G have the lowest response. Other further refinements may follow from discovering rarer SNPs of bigger effects that may have been tagged by the haplotype SNPs. It is also possible that there are non-SNP genetic variants in this region causing the functional effect(s). The underlying mechanism for the effect of host and viral genomes in predicting treatment response to PegIFN/R therapy is still unknown. Two early studies identified lower expression of the non-responder allele in whole blood from healthy controls [3, 4]. Subsequent attempts to identify differential regulation of IL28B by the alleles in blood, immune cells or hepatocytes have not been conclusive, although there is a strong correlation of the IL28B non-responder allele with high expression of interferon-stimulated genes in infected hepatocytes but not uninfected hepatocytes, and evidence for lower expression of ISGs in immune cells of biopsies of infected liver tissue [23–25]. African American haplotypes are shorter and so ideal for narrowing down the potential functional SNPs on the functional haplotypes. This indicates the causal variant lies 5' of rs12979860 and 3' of rs12980275, encompassing the proximal promoter and coding region of the gene. Exonic changes on the non-responder haplotype do not affect function in transformed cells [23, 26]. The TA repeat polymorphism on the non-responder allele affects expression in the proximal promoter region of transformed cells . Responder IL28B alleles and wild-type core 70 mutations are associated with improved early viral kinetics. However, the mechanism for these effects is uncertain, possibly through effects on hepatic type III interferon and ISG induction. Indeed, raised ISG induction in hepatic biopsies of CHC patients is tightly correlated with the non-responder haplotypes, and provides slightly better prediction of SVR [24, 25]. HCV viruses are classified into six genotypes, with genotype 1 being the most widespread (China, Europe, America, Australia) and common [27, 28], the least susceptible to PegIFN/R treatment, and for which prediction from IL28B genotype is most useful. The role of viral genomes in predicting the response to treatment is contentious. Viral genotype and load are important and established predictors of response. Most studies of viral mutations have been from Japan and in persons infected with HCV genotype 1b, where amino acid substitutions at positions 70 and 91 of the HCV core protein and substitutions in the interferon sensitivity determining region (ISDR) of the NS5A protein have been shown to be associated with treatment outcome. The role of IL28B polymorphisms and the above substitutions were recently reported from 817 Japanese patients with genotype 1b CHC . In that report, IL28B rs12979860 CC, core amino acid 70 substitution (non-arginine; odds ratio (OR) 0.53, P = 0.016), age and viral load were predictive of SVR, while IL28B CC genotype, core amino acid 70 substitutions (P = 0.0013), ISDR substitutions (P = 0.0019), viral load GGT, ALT and platelet count were predictive of a rapid virological response (RVR). The role of IL28B SNPs in predicting the outcome of PegIFN/R treatment of infection with genotypes 2 to 6 is controversial. These other genotypes are more responsive to therapy, with around 80% of those infected with genotype 2 clearing virus on treatment . IL28B genotype is correlated with success, but only improves prediction by around 5%. Mangia et al. , using a cohort of 268 Caucasian patients with HCV genotype 2 or 3 infection treated with combination therapy, found that IL28B SNPs were associated with SVR principally in those that did not achieve an RVR. In subsequent studies, IL28B SNPs have been associated with RVR and variably with SVR. Genotype 3, the most common type in India and Pakistan, is thought to be similarly susceptible to PegIFN/R to genotype 2, but clearance success in these different clinical settings has yet to be established. Genotype 4 is thought to be cleared with intermediate efficacy between genotypes 1 and 2/3. It is the most common type in the many millions infected in the Middle East, with near 20% prevalence in the population of Egypt. In a single small study of genotype 4 infected patients, IL28B genotype was shown to influence RVR, SVR and SVR in non-RVR patients . Genotype 6 is the most common form in the many millions infected in Southeast Asia, and genotype 5 the most common in southern Africa [27, 28]. All genotypes are found in Africa, where at least 30 million are thought to be infected, but where genotypes and treatment responses are not well characterized. For HCV genotype 1, within 24 h of first injection, there is a rapid, IL28B genotype-dependent, reduction of HCV viral load . By week 4, undetectable HCV (RVR) predicts clearance better than IL28B genotype, and response-guided therapy, where the time on treatment is determined from the decline in viral load, is based on viral load changes. Even using triple therapy, where PegIFN/R is augmented with telaprevir, for those with the non-responder genotype who do not achieve an RVR, the chances of clearing virus by the end of therapy is 0%, and 59% for those who do achieve RVR; whereas for those homozygous for the responder genotype, 16% will not clear virus if they have not achieved RVR, whereas 84% will clear if they have achieved RVR . Combining RVR, HCV genotype and IL28B genotype may prove useful in guiding therapy where cost is limiting or dependent on time on therapy, particularly in the new era of DAAs (see below). It is striking that in all the genome-wide analysis studies to date, and including genes from the MHC region, only IL28B reaches genome-wide statistical significance. Certain genetic variants are not amenable to SNP chip analysis. These include the MHC region variants and deletion variants such as CCR5 delta 32. In a recent report, Suppiah et al. studied the combined effect of IL28B SNPs with HLA-C, and their ligands, the killer immunoglobulin-like receptors in predicting treatment-induced clearance (n = 417) or failure (n = 493) in Caucasian patients with genotype 1 CHC. The rs8099917 non-responder G allele was associated with failure to clear on treatment (OR 2.19, P = 1.27 × 10-6, 1.67 to 2.88) and absence of spontaneous clearance (OR 3.83, P = 1.71 × 10-14, 2.67 to 5.48), as was rs12979860, with slightly lower ORs. The HLA-C C2C2 genotype was also over-represented in patients who failed treatment (P = 0.024). The prediction of non-response improved from 66% using IL28B to 80% using both IL28B and HLA-C (OR 3.78, P = 8.83 × 10-6, 2.03 to 7.04). Using logistic regression, the combination rs8099917, G*/C2C2 was shown to be partially due to genetic interaction and not just an additive effect, consistent with the known role of HLC-C in the pathogenesis of HCV infection. This combination is present in about 20% of the Caucasian population, and captures a higher percentage of non-responders than using homozygote non-responders alone (Table 3). While the data need replication, the combination of IL28B and HLA-C SNPs appears to improve diagnostic accuracy and clinical utility. Natterman et al. found that prediction of spontaneous clearance in a German cohort was improved using both CCR5delta32 and IL28B rs12979860 SNP. It remains to be seen if these two genes interact in predicting SVR. CHC, chronic hepatitis C; NSVR, non-sustained viral response. aSlightly lower prediction percentage, but identifies a higher percentage of NSVR. bBest prediction. Data from Suppiah et al. .
Clinical and genomic data can be combined for predicting response to combination therapy with PegIFN/RBV in genotype 1 CHC . More recently, serum IP10 , 25 hydroxyvitamin D3 and SNPs in the vitamin D binding protein , and hepatic ISG expression [23–25] have been shown to be additional factors predicting the outcome of therapy. However, while these markers in combination improve diagnostic utility, large-scale prospective trials are unlikely to eventuate given the rapid development of DAA-based regimens. Because HCV and HIV are both blood-borne viruses, where risks of infection are increased by similar practices, co-infection is common. In these cases, two studies have indicated a higher risk of mortality for the rs12979860 CC genotype on antiviral treatment for HIV. In one study, the rs12979860 CC genotype was associated with 54% higher mortality risk compared with TT genotype in HIV-HCV co-infected individuals . In another, the increased risk was 80% . The authors in the latter study speculated that this was due to higher baseline plasma HIV viremia and possibly altered immune reconstitution associated with interferon λ expression. Vispo et al. found evidence that IL28B genotype predicted clearance of HCV genotype 1a, but not 1b, in HIV/HCV co-infection. Dayyeh et al. have suggested that therapy should be delayed in those with non-responder genotypes and HCV genotype 1 infection, depending on the baseline viral load. The major adverse reactions to treatment with PegIFN/R are IFN-induced neutropenia and leucopenia, and ribavirin-induced hemolysis. Two genome-wide analyses, one in Japanese  and one in Europeans , found that SNPs at the inosine triphosphatase (ITPA) locus predicted ribavirin-related hemolysis. No genetic variants were identified associated with neutropenia or leucopenia. To date, no association of IL28B genotype with clearance or response to treatment of other flaviviruses (a group that includes arboviruses such as dengue and West Nile virus) has been reported. This may await interrogation of appropriate cohorts. It may also represent different tropisms of these viruses, to tissues not so dependent on expression of the IL28 receptor. Other RNA viruses, such as influenza, do infect tissues that express the receptor, and so may be affected by IL28B genotype - this has yet to be established. Although IL28B was not associated with clearance of HIV  or hepatitis B [45, 46], the IL28B genotype can affect clearance of hepatitis B on interferon therapy in European and Chinese cohorts [47, 48]. Type 1 interferons are used to treat autoimmune diseases such as multiple sclerosis, and antibodies to interferon α are used to treat systemic lupus erythamotosis, as well as many other inflammatory and autoimmune conditions . It has also yet to be established if the IL28B genotype affects response to interferons in these diseases. Therapy for HCV infection is currently undergoing a radical transformation with the advent of oral medications: the DAAs. The first two to receive US Food and Drug Administration (FDA) approval are the NS3 protease inhibitors boceprevir and telaprevir. These have cure rates substantially higher (about 70 to 80%) than dual therapy with PegIFN/R (<50%), and may allow reduction in treatment duration [49, 50] (Table 4). To minimize the risk of viral resistance, both are used with a PegIFN/R pre-treatment. For both, IL28B genotype predicts SVR. For telaprevir, cure rates (SVR) vary from 90% for rs12979860 CCs, to 73% for TTs. Clearance at 8 weeks for boceprevir/PegIFN/R was achieved for 89% of CCs and 52% of CT/TTs; and at 4 and 12 weeks (no HCV detected at both time points) for 72% of CCs and 52% of CT/TTs. Many more DAAs are in late-stage clinical trials and producing very promising results . They have been so rapidly taken up, especially in the USA, that triple therapy is now considered the new standard of care treatment for genotype 1 HCV there . Dual therapy remains the standard of care treatment for other viral genotypes. %SVR, percentage sustained viral response. Data from SPRINT-2 (boceprevir, BOC)  and ADVANCE (telaprevir, T) clinical trials . SPRINT-2 regime: PegIFN/R for 48 weeks. BOC/RGT: PegIFN/R for 4 weeks, then 24 weeks; BOC and PegIFN/R if HCV undetectable, 44 weeks if not. BOC/PR48: PegIFN/R for 4 weeks, then 44 weeks BOC and PegIFN/R. No hepatitis C virus (HCV) based on detection at 8 weeks. ADVANCE regime: PegIFN/R for 48 weeks. T8 24/48: telaprevir for 8 weeks, PegIFN/R for 24 or 48 weeks, dependent on HCV at 4 and 12 weeks. T12 24/48: telaprevir for 12 weeks, PegIFN/R for 24/48 weeks. No HCV based on detection at 4 and 12 weeks of treatment. However, enthusiasm for these regimens is tempered by the substantially lower cure rates (about 30%) in previous PegIFN/R null responders. In all those failing single DAA-based therapy, future treatment with multiple DAA-based combinations with or without PegIFN/R may be compromised by the development of drug resistance. Further, HCV eradication using single DAA-based strategies, particularly in previous treatment failures, appears to be IL28B genotype dependent. In this context, predicting non-response rather than success is paramount since the former should perhaps have therapy deferred until multiple DAA-based combinations become available. The present results therefore provide a strong rationale for the use of IL28B SNPs such as rs4803221 in combination with the HLA-C genotype, such that those with non-response genotypes are considered for future regimens rather than single DAA-based therapy. Internationally, in the next few years, hundreds of thousands to millions of people with HCV are likely to consider therapy to clear virus, and consideration of IL28B genotype may aid in pre-treatment choice of therapy. As discussed above, such testing can predict the difference between a 15% chance of clearance (for example, for those with HCV genotype 1a and HIV co-infection, or those with rs8099917 GG and HLA-C C2C2 genotypes) to 100% chance of clearance (rs12979860 CC on DAA), depending on the treatment chosen, HCV genotype and HIV co-infection status. This decision will also be greatly affected by the cost of therapeutic options, with vastly different parameters in western countries, Asia, the Middle East and Africa. To the armory of information already obtained will come a need to gather more for the new therapeutic options and for the vastly different clinical settings in the different parts of the world. Specifically, new genetic variants (SNPs, insertions, deletions, gene copy number variants, even RNA isoforms) may identify the few who fail to respond to the triple therapies. Next-generation sequencing studies to identify viral variants that resist particular therapies will be needed. Clinical management may need to be guided by monitoring of the emergence of such viral variants and the rebound of viral load. This work was funded by an Australian National Health and Medical Research Council Project Grant, a MS Senior Research Fellowship to DB, and the Robert W Storr Bequest to the Sydney Medical Foundation. DB and JG have patent applications for using IL28B and HLA-C to predict drug response.